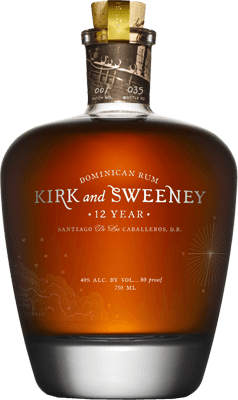 Have you found an online vendor selling Kirk and Sweeney 12-Year? Schöne Flasche und gute Aufmachung. Beautiful bottle and good presentation. This is a rum that could be sold for a much higher cost than it is. Kirk and Sweeney is a true example that price is not a factor for quality and flavor. The bottle looks as good as the rum that's is in it. From the moment you pick it up you know this is gonna be a great rum experience. The heavy bottle fits perfectly in your hand as you pour. Crystaline golden honey cascades into your glass. The first to last sip is a balanced, blissful. Drier than many contemporary rums, with lots of oak and earth. It was preferred in a taste test with friends against the 25 yr El Dorado... Total opposites of course, but for 1/8th the price, I plan to get more K&S next time I find it. I've been drinking Captain Morgan private stock for years, and I never really had the desire to try anything else it was smooth and got the job done. Saw this on sale at the local store and figured I would give it a try, and I'm so glad I did. Not as much vanilla as the Captain, but absolutely no bite at all and tastes great on the rocks. The only bad thing to come out of this discovery is now I want to keep trying new more expensive rums to see if I can tell the difference. Was looking forward to trying this highly estimed bottle, but to me it's kind of a let down. It'smedium priced in Denmark, but bested by a lot of simerly priced bottles. It offers a bit of vanilla, dark chocolate and dark berries, but is dominated by somewhat bitter oaky notes. This is normally not a put down for me, but the balance just seem's off here. Could be that I need to try it again. I purchased this for only $33.99 (K&L Wines 2015), so based on the price my expectations weren't that high. But this rum greatly exceeded my expectations! It tastes like an agricole, albeit an exceptional one, and tastes at least as good as the far more expensive Clement XO (imho). It smells and tastes of sugar cane, caramel, vanilla, cookie dough, oak, honey, and molasses. One of the best rum values in my opinion, this is a must try! Edit: I've since tried the 18 and 23year Kirk & Sweeney, which are considerably better! This rum is about as good as it gets in the mid-upper price zone - at about $35 bucks a bottle - this rum is smooth and flavorful with a lot of fruity flavors and just enough woody vanilla overtones to be an excellent rum and not a whiskey wannabe. 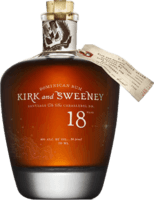 I'm not one who normally drinks rum straight but the Kirk and Sweeney 12 year rum is so smooth that it actually might be one I could enjoy neat. However I use it as is my norm in Coke Zero and it blends amazingly well (3oz in a 16.9oz Coke Zero). In fact it actually makes the Coke Zero taste better IMHO. 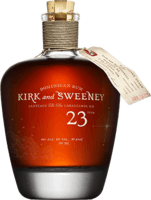 I recently found the K&S 23 year rum and will try it soon comparing it to the 12 year to see if I (a rather rum-uneducated fellow) can detect any discernible differences. However based upon how good the 12 year it, I expect the 23 year rum to be, at least, equally as good. Perhaps better. We shall see. BTW, the bottle is rather unique in that how thick and heavy the glass is. Almost too nice to recycle once the rum is gone. Any suggestions on a re-use for the K&S bottle? This is rum is what bourbon dreams about. Great alone on ice. I made a Manhattan out of it just for S&G and it was grand. I called it a Kingston Manhattan. Try one. Can't believe this great tasting rum csn be so inexpensive. Now taste for yourself and i think you'll agree. Very smooth. Rosewater and sugar notes. Very little wood. Probably the best looking bottle on my shelf too. Factoring for price and 12-year aging, a 5/10 is where this one goes easily. This is a rum with an identity crisis. I want to invest in this company! This rum could come in a bag and It would still shine. This is definitely one of my current top three. Big body, still smooth, with a long vanilla finish. I'm not sure why everyone likes this so much? Maybe I should give it another go, but I wasn't impressed. got a bottle for my birthday. As soon as I popped the cork I knew it was gonna be good. It is Very smooth. This bottle won't last long. Very (too? )smooth, a little sweet, and a nice finish. Somewhat base and it does not stand up to mixing. My thoughts have soured as time goes by. Am I drinking the same rum that everyone else is rating here? Virtually no sweetness, just a spiciness and too much bitterness which I assume is the charred oak. The finish is short and bitter. Luckily I caught this on sale for cheap. Hey, I really wanted to like this but it is what it is. Took a bottle of this to my buddy's occasional rum "marketing" night. He is much more well versed in rum than I, but he had never had the Kirk. I like it because it's so smooth, not as sweet as some, but with a little not of honey and not much wood flavor. Just right with a small chunk of ice. Will continue to have it in my reserve area. I am always in search of the perfect Rum to go with a cigar. The Kirk & Sweeney is my go to and the best I have tried. The price point makes it a consistent option! I like to pour it over a large ice cube and sip! Very strong smells of vanilla, oak and toasted marsh mellow. Very strong oak taste for only being 12 years old. I also taste tons of Vanilla and some mild spice. Not bad but not on my top shelf. After what seemed like an eternity, I had the great pleasure to finally get my hands on a bottle of Kirk & Sweeney. Packaging alone suggests it's gonna be nice. Right from the pop of the cork my nose was flooded with the aroma of tropical fruit, sweet treacle, a little wood and just a hint of butterscotch. Finishing with a decent amount of smoke. Oh yeah! This is gonna be lovely. It's difficult not to admire the beautiful and thoughtful packaging of this rum. But no stuffed shirt, this. To my taste, an exceptional balance of wood-aged flavors, both in the nose and the mouth. Just the proper suggestion of native rum sweetness, while supplying a tremendously smooth and buttery finish. A tremendous modern rum and, like the Plantation Barbados 5 Year, sporting an incredible price for this level of rum value. ....at my local supermarket and thinking why oh why don't they ever have anything of interest. And then rather surprisingly I came across this chap. As I was standing in the aisle, I cracked out the mobile app and saw the very mixed reviews. But even so, I was curious. I knew about K&S but never got around to trying it. Its at the upper limits of what I really like when it comes to sweetness (natural or at least, with only a small amount of sugar added), but it is all held together by the burn from the alcohol that had me checking whether this was actually at 40% as it has a harshness to it that I would expect from say 46%. However it pulls together the sweetness, the vanilla and the toasty American oak (I have to say I am a sucker for American oak ageing). Without the hit from the alcohol, I suspect that this wouldn't be dry enough for me. Soft, even with the burn, multi-dimensional with a medium/long length. I can see why this divides opinions, but I find it initially quite appealing. I read some reviews questioning whether they are drinking the same rum as everyone else - I do not know whether the label is a "fake" historic one to go with the story or whether when it states Batch 021 Bottle Nº 7915 that is the current batch, but that is how my bottle is so labelled. Smooth and as distintive as diplomatico. A fine birthday present for me.